UPDATED, Wednesday, June 27 at 8:32 a.m: Developers in Greenwich Village might feel like they’ve been transported back to the height of the market in a time machine. The Village is rare example of a sellers’ market. Condo supply is low, demand is strong and the pipeline of new units isn’t going to take well into the next decade to burn off. And the neighborhood is not alone. The Flatiron District, Lenox Hill and the Upper West Side not only have relatively low levels of existing condo inventory, but also have declining pipelines — creating a healthier supply-demand equilibrium. In Greenwich Village and the West Village, for example, there are only 91 units either on market or in the pipeline, and inventory has been declining since the tail end of 2015, according to an analysis by The Real Deal, which looked at the new condo pipeline — including both unsold units (minus in-contract properties) as well as units set to come online in the next few years. The largest project in the neighborhood — Rudin Management’s 198-unit conversion of St. Vincent’s Hospital into Greenwich Lane — launched in 2013 and is mostly sold out. Given that much of the Village is landmarked, few new projects are ever developed there. And those that do get the green light are usually on the smaller side. Halstead’s Schneiderman said developments like Ian Schrager’s 160 Leroy Street and Billy Macklowe’s 21 East 12th Street are among the biggest success stories in the city. “Those are the top new developments right now from an absorption standpoint,” he said. Macklowe has yet to start closings at his 52-unit project, but StreetEasy shows the majority of apartments — 38 units — already under contract. And Schrager’s 47-unit development shows 29 units under contract. 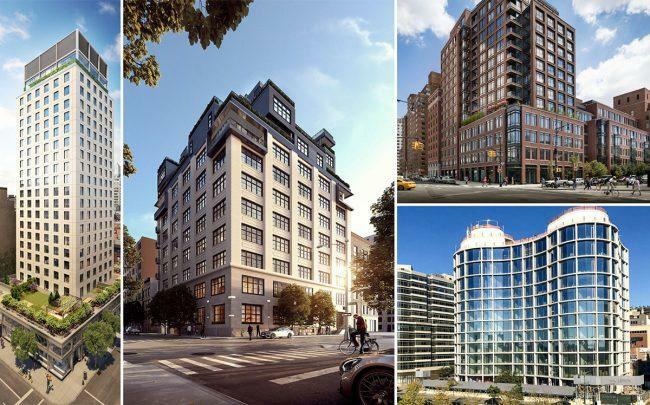 Brack Capital Real Estate, meanwhile, quietly started sales last fall at the one of the larger projects left in the neighborhood: the 35-unit 90 Morton Street. When the developer officially launched sales and listed apartments on StreetEasy in mid-April, it showed eight units in contract for $4 million and up. Brokers and developers not affiliated with the project, however, speculated that the developer might have sold to investors at a discount. Reuveni Real Estate President Shlomi Reuveni, who is handling sales at the building, declined to comment on the identities of the buyers. But he said demand is strong. “We’re increasing prices — not reducing prices,” he said. Correction: An earlier version of this report mischaracterized the market as strong for buyers, not sellers.